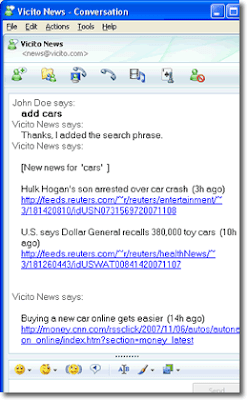 Vicito News allows you get personalized news over your instant messaging client. Vicito News make it easy to keep up with news relevant to you, no matter what source it comes from. It scans news from hundreds of unique sources all day. While doing this it checks for stories that match your search phrases. When it finds matching stories Vicito News IM you the links in batches as often as you choose. If you are signed out of your IM service, marked as away or do not disturb, it won't bother you with news updates. When you are available again, it will send you stories it has found for you. Vicito News currently support 3 popular instant messaging services: Google Talk, AIM, and Windows Live Messenger.